Vinay Easwaran from Bangalore, Diploma Graduate. 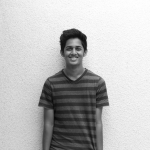 Vinay Easwaran is Student and currently have no work experience. PROGRAMMING PHOTOSHOP SPREADSHEET WEB DESIGN PROGRAMMING AND DESI.. PHOTOSHOP SPREADSHEET CRICKET CREATIVE & INNOVATIV..
are one of expert skill area's of Vinay Easwaran . Vinay Easwaran is working in IT Software industry.